This article first appeared in the Rushville Republican on April 17, 2018. The renovation began with a bequest by a grateful and generous donor who wished to remain anonymous. This donor was a former patient on Med Surg. She experienced firsthand the empathy, skill and caring of the RMH nursing staff. As a patient she also saw that with better equipment, the nurses would be able to do even more for their patients. In her will, she specified that her gift to the hospital be used to benefit the Med Surg unit. The nurses of the unit are deeply grateful. Carrie Tressler expressed it best. “I feel so honored and proud of the care our nursing staff gives, and that it led to such a wonderful donation,” she said. When this gift was received, the RMH nursing staff began to research ways to use this donation wisely. They decided to focus on increasing patient safety and making patients more comfortable. Part of patient comfort, they realized, was making family and visitors more comfortable. The resulting design was for patient rooms that would be new from the inside out. The new rooms would be private and would include a seating area for visitors and family. They would be large enough to expand into two bed units if more beds were ever needed. 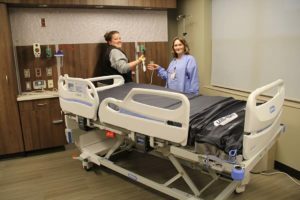 In choosing state of the art equipment for the new rooms, the nurses focused first on the place where patients spend the greatest amount of time: the bed. A committee of nurses was formed to select the best bed for their patients. After much debate and deliberation, they agreed upon a bed that was still in the production stages when they chose it. As a result, RMH was one of the first hospitals to purchase computer controlled Centrella Smart Beds from Hillrom. Centrella Smart Beds are particularly beneficial for reducing patient falls. They issue verbal safety alerts to patients who are getting out of bed when they are not supposed to. A light under the bed automatically comes on to light the way when patients get up to go to the bathroom at night. Lights projected onto the floor at the foot of the bed indicate possible fall risks to nurses passing in the hall. The lights indicate if the railing is up or down, if the patient is out of bed and whether or not the bed is set as low as possible. Verbal alerts also warn the nursing staff if the brake is not set on the bed, or if the call light it not connected. Centrella Smart Bed mattresses contain air pockets which help reduce the incidence of bed sores. This helps lower the risk of infection. The beds also automatically weigh patients, allowing nurses to avoid the often painful process of moving the patients out of bed and onto a scale. Anyone who has visited a hospital has noticed the amount of equipment that can be crowded around a hospital bed. Part of the Med Surg renovation included the installation of “equipment wall units.” These units allow medical equipment to be attached to the wall instead of standing on the floor. This decreases fall risks for patients and allows easier access for nursing care. No renovation would be complete without new paint, new flooring and new furniture. All of these details are included in the Med Surg renovation. Patients to the Med Surg unit will benefit from the kindness of a woman whose name they will never know. Fortunately, those who remember the “old Med Surg” will realize that a person doesn’t need to leave a name in order to leave a legacy.